Aviation Headsets & Adapters. Display Boat & Airplane Models. Outdoor & Sporting Products. Shooting Gear & Glasses. PilotUSA Headsets & Adapters. Randoplh Ranger Shooting Eyewear. Rod Machado’s Books & Tapes. 49mm Randolph P3 Sunglasses. 51mm Randolph P3 Sunglasses. 52mm AO Original Pilot Sunglasses. 52mm Randolph Aviator Sunglasses. 55mm AO Original Pilot Sunglasses. 55mm Randolph Aviator Sunglasses. 57mm AO Original Pilot Sunglasses. 57mm Randolph Concorde Sunglasses. 58mm Randolph Aviator Sunglasses. 61mm Randolph Concorde Sunglasses. Sometimes it is difficult to decide which is the correst sunglasses size for you. Generally speaking, a normal sized man will choose the 55mm or medium size. Larger men and men with more round heads wil usually find the 57mm-58mm or Large size fits best. Small men and women will generally need the 52mm size. 49mm Size = 4.66″ Wide Frame 51mm Size = 4.70″ Wide Frame 52mm Size = 5.00″ Wide Frame 55mm Size = 5.25″ Wide Frame 57mm Size = 5.50″ Wide Frame 58mm Size = 5.75″ Wide Frame 61mm Size = 6.00 Wide Frame. American Optical AO Original Pilot Gold Cosmetan Brown Lenses USMC USAF USN. 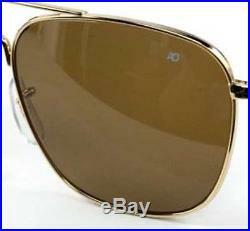 AO® Original Pilot Sunglasses Gold Frame with Bayonet Temple and True Color Cosmetan Brown Non-Polarized Glass Lenses. Protect your most important sensory asset – your eyes! Whether you are a pilot like me, a sailor or simply spend a lot of time driving or outdoors, you MUST protect your eyes at all times! The best way to do that is with Genuine, Brand New, AO® Eyewear American Optical Original Pilot Sunglasses from my store! Consider the following feedback. The best of the best…. E suis très satisfait. AO Eyewear American Optical Original Pilot sunglasses have been standard issue for the U. Air Force and are chosen by military and civilian pilots alike around the world. For pilots non-polarized sunglasses are important to provide adequate recognition of other aircraft quickly and easily without distortion. Many of today’s modern cockpits come with liquid crystal displays which can be distorted by polarized sunglasses, a problem not present with non-polarized sunglasses. Why AO Eyewear American Optical Eyewear Original Pilot Sunglasses? For over 100 years the tear drop aviator shape has been a popular classic because it is the most functional of all eye shapes. AO Eyewear American Optical has now adopted an eight-base curve and top optical technology to create the ultimate combination of style and function. Armed Forces’ best kept secret is now available to consumers. Performance tested sunglasses with classic aviator styling, these Original Pilot sunglasses by AO Eyewear have been the favorite of U. Military pilots for over 40 years. These sunglasses are engineered to exacting military standards and have been issued to millions of servicemen allover the world since 1958. Rugged and sturdy, these sunglasses come with a steel alloy frame with a high quality finish. The lenses are distortion free, toughened and are made out of polished True Color® glass. AO Eyewear® American Optical Original Pilot Sunglass details. Rugged Steel Alloy Frame. True Color Cosmetan Brown Non-Polarized Glass Lenses. Genuine brand-new AO Eyewear American Optical Original Pilot Sunglasses come in genuine AO factory box. Assembled in the U. Military pilots of all branches since 1958. Frame is constructed with self locking micro screws. Each pair has self adjusting nose pads. 100% UVA, UVB & UVC protection. They protect a pilot’s most important sensory asset – eyes. They protect ocular tissue from harmful solar radiation. They reduce the effects of harsh sunlight. They protect eyes from impact with flying objects. They aid in the dark adaptation process which is delayed by exposure to sunlight. The True Color Glass lenses come with 100% UVA/UVB protection. They make you look cool! Don’t hesitate – get your very own AO® Original Pilot Sunglasses today! So, when NASA Astronauts lifted off for the moon on Apollo 11, AO Original Pilot Sunglasses were right there with them. When Top Gun pilots climb into the cockpit, they are wearing AO Original Pilot sunglasses. Whether you are a pilot, or drive your car a lot, one very important thing you really need are a a pair of great sunglasses! AO® Original Pilot Aviator Sunglasses. Questions about this item? Our eFulfillment centers are open Monday through Friday and closed weekends and holidays. We welcome your questions and will try to answer them as quickly as possible. Please provide as much information as possible so that we can provide the very best answer possible. We are satisfied only if you – our Customer – is satisfied! Why Shop With Us. Join Our Mailing List. Sign up for our store newsletter and be the first to hear about new items and special limited-time discounts! Pilot Supplies & Sunglasses. The item “American Optical AO Original Pilot Gold Cosmetan Brown Lenses USMC USAF USN” is in sale since Monday, October 20, 2014. This item is in the category “Clothing, Shoes & Accessories\Men’s Accessories\Sunglasses & Sunglasses Accessories\Sunglasses”. The seller is “jetaviator7″ and is located in Southbridge, Massachusetts. This item can be shipped to United States, Canada, United Kingdom, Denmark, Romania, Slovakia, Bulgaria, Czech republic, Finland, Hungary, Latvia, Lithuania, Malta, Estonia, Australia, Greece, Portugal, Cyprus, Slovenia, Japan, China, Sweden, South Korea, Indonesia, Taiwan, South africa, Thailand, Belgium, France, Hong Kong, Ireland, Netherlands, Poland, Spain, Italy, Germany, Austria, Israel, Mexico, New Zealand, Philippines, Singapore, Switzerland, Norway, Saudi arabia, Ukraine, United arab emirates, Qatar, Kuwait, Bahrain, Croatia, Malaysia, Brazil, Chile, Colombia, Costa rica, Dominican republic, Panama, Trinidad and tobago, Guatemala, El salvador, Honduras, Jamaica, Antigua and barbuda, Aruba, Belize, Dominica, Grenada, Saint kitts and nevis, Saint lucia, Montserrat, Turks and caicos islands, Barbados, Bangladesh, Bermuda, Brunei darussalam, Bolivia, Ecuador, Egypt, French guiana, Guernsey, Gibraltar, Guadeloupe, Iceland, Jersey, Jordan, Cambodia, Cayman islands, Liechtenstein, Sri lanka, Luxembourg, Monaco, Macao, Martinique, Maldives, Nicaragua, Oman, Peru, Pakistan, Paraguay, Reunion.